It’ll be another month before accused WikiLeaks contributor Bradley Manning is back before a military judge, but his supporters say a fair trial is still far away. The Army has denied the requests to have a UN official at the next round of hearings. 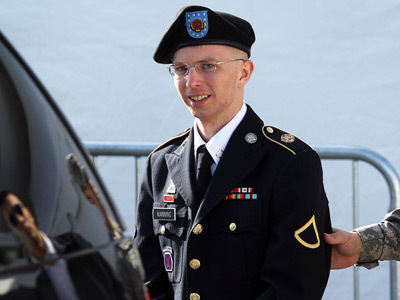 During Thursday’s pretrial hearing at Ft. Meade outside of Washington, D.C., the military justice presiding over the case pertaining to Private First Class Bradley Manning’s alleged leaking of sensitive documents challenged two of the defense’s requested witnesses. Along with rejecting Lt. Col. Dawn Hilton, commander of the Joint Regional Correctional Facility (JRCF) at Fort Leavenworth, Army Col. Denise Lind also told Manning’s attorneys that a torture expert from the United Nations would be barred from presenting testimony. David Coombs, the civilian attorney representing PFC Manning, had requested that Juan Mendez, the UN’s special rapporteur on torture, be allowed to present during the next round of hearing. Those motions, scheduled to begin in late August, will involve discussions involving the nine months Manning spent in solitary confinement at the Quantico Marine Brig. in Virginia. Mendez has previously argued that the conditions that Manning was subjected to were considered torturous under the UN’s guidelines, but Col. Lind will not allow him to be questioned before the court. 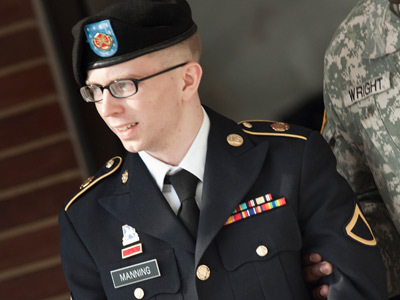 In the midst of an investigation into the military’s treatment of Manning last year, Mendez told The Guardian that he was “deeply disappointed and frustrated by the prevarication of the US government with regard to my attempts to visit Mr. Manning.” Mendez had attempted to meet with Manning in private while he was held in solitary confinement without being charged with a crime. When Mendez finished his report on behalf of the UN this year, he concluded that the military’s treatment of Manning was beyond unreasonable. "The special rapporteur concludes that imposing seriously punitive conditions of detention on someone who has not been found guilty of any crime is a violation of his right to physical and psychological integrity as well as of his presumption of innocence," Mendez wrote. During this week’s hearings, Col. Lind said that prosecutors could not present evidence of any harm posed on Manning during his imprisonment because it was irrelevant to whether or not his nine-months of confinement was illegal. The court has also dismissed motions that would focus on the harm, or lack thereof, that the leaks caused. The Pentagon argues that shifting the case to concentrate on the degree of any damage done would be confusing, but that attorneys could allude to it through witnesses once the actual trial is underway. Manning faces life in prison if found guilty of aiding an enemy, a charge the military has introduced in response to accusations that the serviceman sent classified information, including thousands of diplomatic cables, to Julian Assange’s WikiLeaks site. Earlier this week, Mr. Coombs argued that the charge implies that Manning would have aided the enemy simply by sending intelligence to a third-party. Had he been tried as a terrorist, argued Coombs, the court would be more lenient on his client. "I was stripped of all clothing with the exception of my underwear. 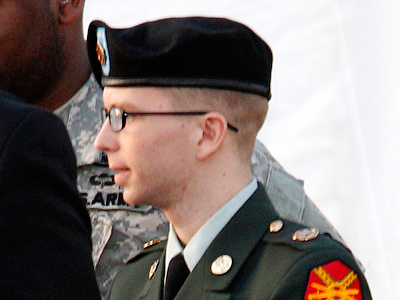 My prescription eyeglasses were taken away from me and I was forced to sit in essential blindness,” Manning told a military attorney last year. 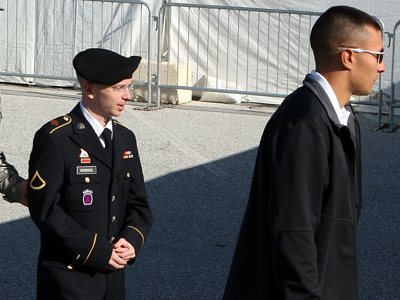 Speaking to the Guardian last January, David House of the Bradley Manning Support Network said that the serviceman seemed “catatonic” when he visited to him at Quantico. 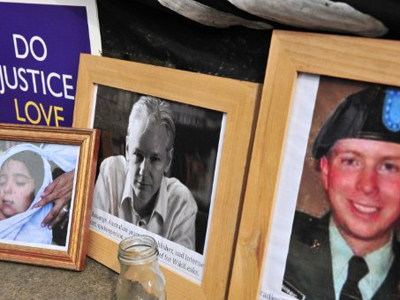 Amnesty International’s UK campaign director, Tim Hancock, has also called the military’s treatment of Manning “cruel, inhuman and degrading,” and, in November 2011, 50 members of the European Parliament urged the United States government to intervene in the imprisonment. "We certainly do not understand why an alleged whistleblower is being threatened with the death penalty, or the possibility of life in prison. 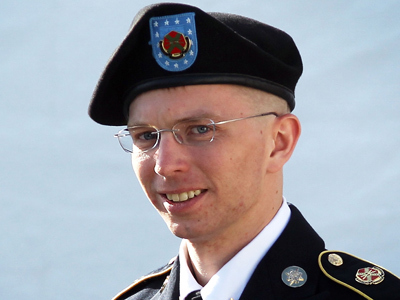 We also question whether Bradley Manning's right to due process has been upheld, as he has now spent over 17 months in pre-trial confinement,” the MPs wrote. 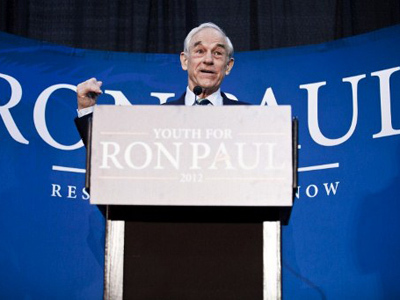 Mr. Coombs argues that the military court has yet to prove if — and how — the accusations Manning is charged with damaged national security.